For an example, If you want to use it with your PC, you should already have a Good Sound Card or a Headphone Amplifier that can truly power this Headphone. You can also use Headphone Amplifier with your portable device like iPod. Only headphones of this kind can bring across the feeling of closeness and transparency--nothing stands between sound enthusiasts and their music. The perfect music experience in undisturbed surroundings. Smoke and kid free. In excellent condition. These are an excellent reference headphone, especially when paired with a decent headphone amp. technoloy provides the highest level of efficiency, and the open design proved spacious sound and high resolution. We provide our services based on our motto. This item is 100% authentic, Japanese goods. TEST TITLE. Beyerdynamic t90 jubilee headphones, Serial number . Condition: Brand New Color: BLACK Bidding Quantity:1 pair of ear pads (2 pcs) Material: FOAM AND PROTEIN LEATHER FIT: Beyerdynamic CUSTOM ONE PRO MMX300 RSX700 T5P T70 T90 t70p You will receive: 1 pair of ear pads (2pcs ). Beyerdynamic T5P T70 T70P T90/HS200 HS400 HS800 Headphone. 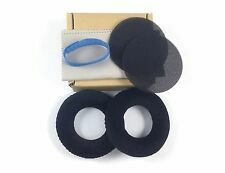 Black Leather Ear Cushion Pads for. 3M Components. 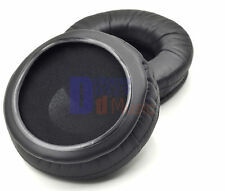 Compatible Ear Pads Cushions – Black. Long lasting, Soft & Durable Comfort. As we know, most of the ear pad of headset are made of leather or Velour, which are very difficult to clean, however, if not be cleaned for a long time, the era pads will be polluted by the secretions of face, it is horrible for a music fan hearing music with a dirty and full of bacteria headphone, so we highly recommend to replace the ear pads every three to six months. 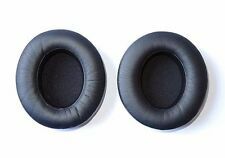 What you are viewing is a custom made Replacement Ear Cushions ideal replacement for your lost/broken or dirty Beyerdynamic DT880 DT860 DT990 DT770 AKG K240 K204s K240MKII K241 K270 K271 K272 ISK HP-980/HP980 ISK980 Headphone ear cushions,they are made of Protein PU leather, durable, soft and noise proof. .